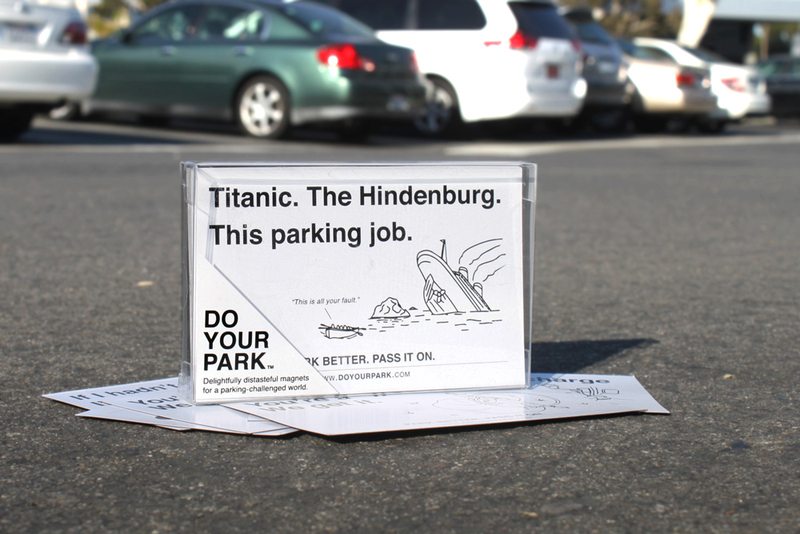 The idea for Do Your Park came to us while we were both undergraduates at the University of California, Davis campus. We were coming out of a meeting with a mentor regarding a previous entrepreneurial venture. As we returned to the car, we saw that the driver's side door had been blocked in by a massive pickup truck. To make matters worse, the truck was parked in a handicap spot with -- you guessed it -- no handicap placard. If you're like us and have ever experienced terrible parking, you can probably understand the desire to publicly chastise the offender. 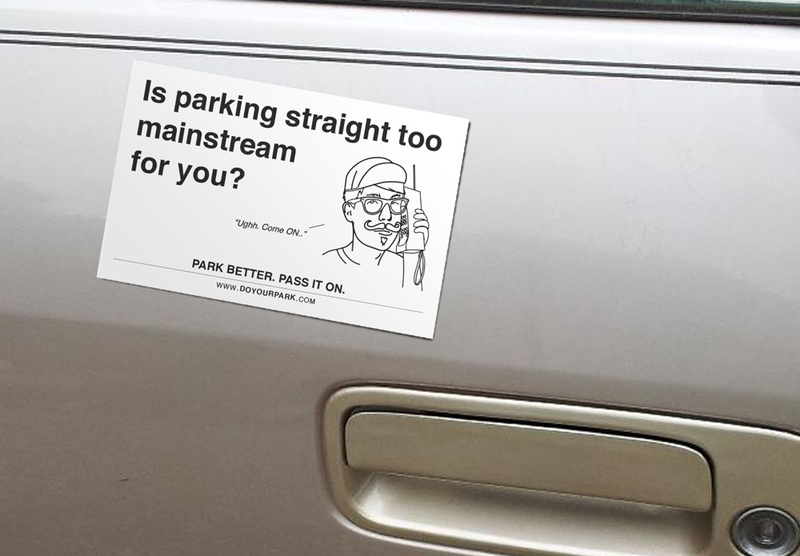 Two years later, the idea resurfaced and we launched a Shopify store called Do Your Park, a company committed to designing car magnets that offer a funny, non-violent way to express your disapproval over the most offensive parking jobs. 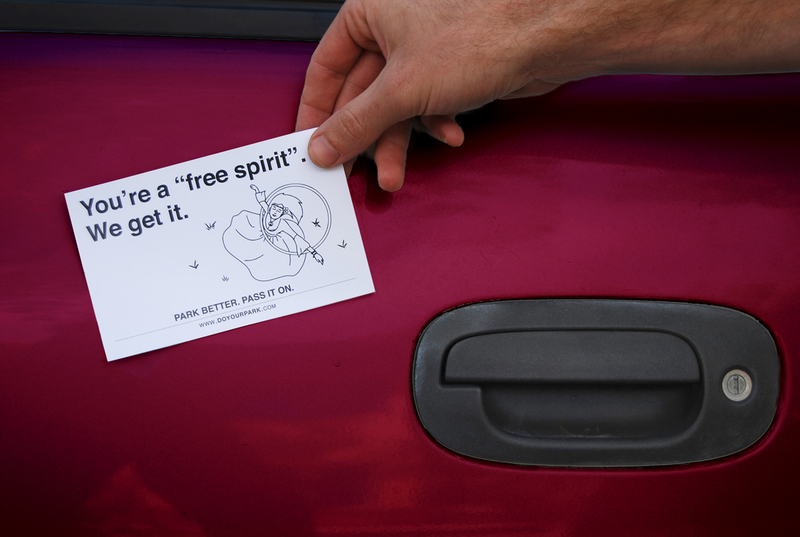 Best of all, these magnets don't cause any damage to the car and can be re-used by the recipient. 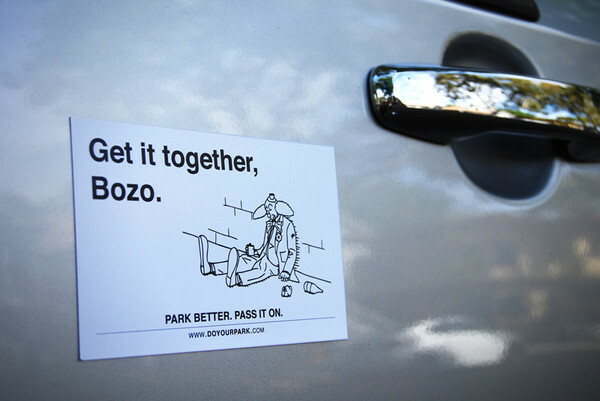 In fact, that's the whole idea behind our slogan: Park Better. Pass it On. One of the challenges with Do Your Park has been to straddle the line between being humorous and overly offensive. Currently, we offer a pack of 10 delightfully-distasteful magnets, each with a different phrase and matching illustration. Some are lighthearted jabs at the driver's inability to park between the lines, while others would make even a sunburned Irishman blush. The reason for this is that we have a massive target audience. Think about the last time you tried to find parking at the mall around Christmas. See? We've got you covered. In building our site, we tried out several different ecommerce platforms and decided on Shopify. Previously, we noticed a lack of conversions from the cart page to checkout, but with Shopify, we shortened the sales cycle by minimizing customer touch points. In doing so, we made the design and process much more user-friendly, with our own added flair. Figure out how you're going to generate revenue (ahead of time): In college, we were strong believers that if you build a quality product, the money will follow. Our first venture was based on this very premise, which slowed us down coming out of the gate. We've abandoned this idea the second time around. Find a real problem and solve it: Sometimes the problem is right in front of you. This one had four wheels, a trailer hitch and a bumper sticker that said "YOLO." (Fun fact: UC Davis is actually located in Yolo County). Figure out how to solve that problem and you've got yourself a product that customers will pay for. Blogs are your friend: Most of our site traffic has been driven by product blogs. LaughingSquid and TrendHunter were blogs that put us on the map. One morning we woke up and had almost a 500 percent increase in unique visitors to the site. Needless to say, we're big believers in the power of blogging. 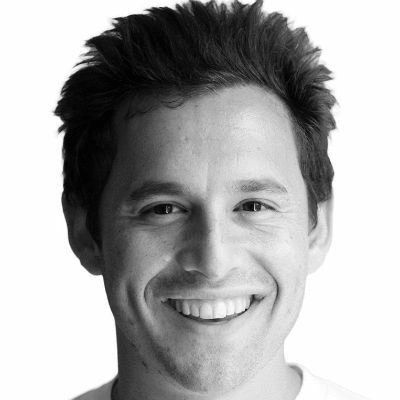 Peter Vandendriesse is an experienced visual designer with a history of entrepreneurial endeavors and eye-catching marketing campaigns. Alain Glanzman is an entrepreneur and consultant for nonprofits and Fortune 500 companies. He has successfully launched products in Europe, Africa, and South America and has worked across various industries.